The alcoholic beverage market includes beer, wine, and spirits. Beers, lager, and cider consumption made up about 89 percent of the global alcoholic beverage consumption in 2014. Beer is a widely consumed alcoholic beverage throughout the world and global production figures have shown an increasing trend during the last decade. In 2015, the United States was the second largest country in worldwide beer production with an amount of about 224 million hectoliters, following only China. On the consumer side, the Czech Republic reported the highest per capita beer consumption in 2015. Traditionally well-known for its large beer culture, people in Germany drank about 104.7 liters per capita in that year. The global wine market was led by Italy, Spain and France regarding the total amount produced. The U.S. was ranked as the fourth largest production country with a production volume amounting to 23.9 million hectoliters in 2016. The country was also listed among the largest global wine exporters in that year. According to industry experts, the E&J Gallo Winery Inc. was the leading winery worldwide in 2015, based on the commercialized production volume. The California-based winery accounted for a global wine volume market share of 3.39 percent. 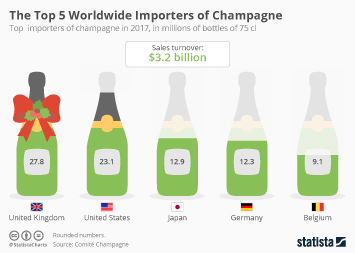 The company's main competitors were multi-alcoholic beverage manufacturer Constellation Brands Inc. and wine and spirit specialist The Wine Group Inc. in that year. Over the past few years, spirits market sales made up over a third of total alcohol sales in the United States. The spirits industry generated about 113.78 billion U.S. dollars in sales in 2015. Based on generated sales, Diageo-owned Smirnoff was the best-selling vodka brand worldwide with a sales volume of 25.7 million 9 liter cases in 2015. In terms of the calculated brand value, the Baijiu brand Moutai took the global lead. Total alcoholic beverages sales in the U.S.
Beer production in the U.S.